Studies indicate the immobilization due to bedrest is a concern for older patients, who lose their ability to perform daily activities as well as quality of life. The earliest references to bedrest seem to have occurred around 450 bc, and even then, Hippocrates warned people that protracted bedrest could cause sarcopenia, osteoporosis, and tooth loss.2 Before the 19th century, survival required plenty of activity, so bedrest was perceived as being irresponsible.3 With improvements in automation and industrialization, people began to believe that complete rest would be restorative. Bedrest became a fashionable intervention. Bedrest adversely affects every system in the human body.15 Psychologically, the loss of personal control that accompanies bedrest is horribly debilitating, and it can also affect the patient’s family members because it creates a need for greater caregiving. Both patients and family members may develop anxiety, confusion, depression, and forgetfulness. 3 Bedrest prescribed for healthy people makes them less able to make decisions, sometimes struggling with strategy development and actions associated with executive function and goal-directed behavior. 16,17 Immobilized patients also develop sleep disorders more than those who are ambulatory.18 In psychiatry, bedrest was traditionally used to convince patients that they were really ill and needed treatment4; learned helplessness develops in people with other conditions when they come to the same conclusion. As bedrest continues, it affects other systems, creating a downward spiral that contributes to psychological concerns. Our space program learned early on that astronauts needed exercise to save their muscles.7 Experts estimate that to regain functional loss here on the ground, patients need approximately 7 days of normal movement for each day of bedrest. In healthy older adults, as little as 10 days of bedrest is associated with considerable loss of strength and aerobic capacity as well as a tendency toward reduced physical activity that can last weeks.24 Avoiding or curtailing unnecessary or prolonged bedrest is critical. Pharmacists should be vigilant when they see any order for bedrest in a previously ambulatory patient, or hear that a patient is bedbound. 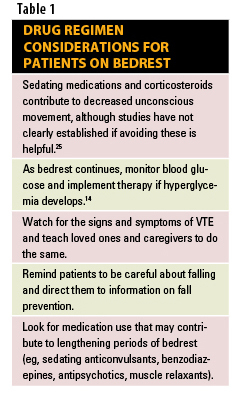 Table 1 lists tips for drug regimen review. 1. DeLaune SC, Ladner PK. Fundamentals of Nursing, Standards & Practice. 2nd ed. Clifton Park, NY: Delmar; 2002. 2. Chadwick, Mann. The Works of Hippocrates. 1950. 3. Knight J, Nigam Y, Jones A. Effects of bedrest 1: cardiovascular, respiratory and haematological systems. Nurs Times. 2009;105:16-20. 4. Boschma G. The Rise of Mental Health Nursing. Amsterdam: Amsterdam University Press; 2003. 5. Dock W. The evil sequelae of complete bed rest. JAMA. 1944;125:1083-1085. 6. Asher R. The dangers of going to bed. Br Med J. 1947;2:967-968. 7. Buckley JC. Space physiology. New York: Oxford University Press; 2006. 8. Gillis A, MacDonald B, MacIsaac A. Nurses' knowledge, attitudes, and confidence regarding preventing and treating deconditioning in older adults. J Contin Educ Nurs. 2008;39:547-554. 9. Hirsch CH, Sommers L, Olsen A, Mullen L, Winograd CH. The natural history of functional morbidity in hospitalized older patients. J Am Geriatr Soc. 1990;38:1296-1303. 10. Sager MA, Franke T, Inouye SK, et al. Functional outcomes of acute medical illness and hospitalization in older persons. Arch Intern Med. 1996;156:645-652. 11. Covinsky KE, Palmer RM, Fortinsky RH, et al. Loss of independence in activities of daily living in older adults hospitalized with medical illnesses: increased vulnerability with age. J Am Geriatr Soc. 2003;51:451-458. 12. Rudberg MA, Sager MA, Zhang J. Risk factors for nursing home use after hospitalization for medical illness. J Gerontol Med Sci. 1996;51A:M189-M194. 13. Fortinsky RH, Covinsky KE, Palmer RM, Landefeld CS. Effects of functional status changes before and during hospitalization on nursing home admission in older adults. J Gerontol Med Sci. 1999;54A:M521-M526. 14. Truong AD, Fan E, Brower RG, Needham DM. Bench-to-bedside review: mobilizing patients in the intensive care unit--from pathophysiology to clinical trials. Crit Care. 2009;13:216. 15. Allen C, Glasziou P, Del Mar C. Bed rest: a potentially harmful treatment needing more careful evaluation. Lancet. 1999;354:1229-1233. 16. Lipnicki DM, Gunga HC, Belavy DL, Felsenberg D. Decision making after 50 days of simulated weightlessness. Brain Res. 2009;1280:84-89. 17. Lipnicki DM, Gunga HC. Physical inactivity and cognitive functioning: results from bed rest studies. Eur J Appl Physiol. 2009;105:27-35. 18. Fox MT, Sidani S, Brooks D. Perceptions of bed days for individuals with chronic illness in extended care facilities. Res Nurs Health. 2009;32:335-344. 19. Nigam Y, Knight J, Jones A. Effects of bedrest 3: musculoskeletal and immune systems, skin and self-perception. Nurs Times. 2009;105:18-22. 20. LeBlanc A, Rowe R, Evans H, West S, Shackelford L, Schneider V. Muscle atrophy during long duration bed rest. Int J Sports Med. 1997(18 suppl 4):S283-S285. 21. Hamburg NM, McMackin CJ, Huang AL, et al. Physical inactivity rapidly induces insulin resistance and microvascular dysfunction in healthy volunteers. Arterioscler Thromb Vasc Biol. 2007;27:2650-2656. 22. Gharib C, Maillet A, Gauquelin G, et al. Results of a 4-week head-down tilt with and without LBNP countermeasure: I. Volume regulating hormones. Aviat Space Environ Med. 1992;63:3-8. 23. Knight J, Nigam Y, Jones A. Effects of bedrest 2: gastrointestinal, endocrine, renal, reproductive and nervous systems. Nurs Times. 2009;105:24-27. 24. Kortebein P, Symons TB, Ferrando A, et al. Functional impact of 10 days of bed rest in healthy older adults. J Gerontol A Biol Sci Med Sci. 2008;63:1076-1081. 25. De Jonghe B, Sharshar T, Lefaucheur JP, et al; Groupe de Réflexion et d’Etude des Neuromyopathies en Réanimation. Paresis acquired in the intensive care unit: a prospective multicenter study. JAMA. 2002;288:2859-2867. Ms. Wick is senior clinical research pharmacist at the National Cancer Institute, National Institutes of Health, Bethesda, Maryland.